Russell Rathbun’s book is funny, thoughtful and crazy … in a good way. I was reminded of the off-balance depths of Douglas Coupland’s best writing. Full disclosure: Russell is a friend, and I was a member of his congregation for over seven years. Yes, most of the sermons in the book I’ve heard before. They actually come across better in print, or at least, in the context of the whole book. He’s done a good job weaving these parts together. I especially liked how dis-integrated/confused the identities of the character(s) got in the second half of the book. The levels of identity kept shifting on me: was it a typo? did he really mean Rathbun, not Lamblove? 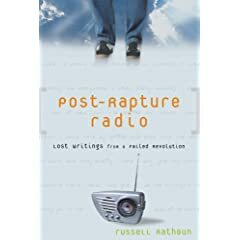 That sense of keeping the reader (listener) off-balance is what I’ve always enjoyed about Russell’s sermons: in the space that opens when I’m off-balance or caught thinking in a different direction, the shock of the twist, the unexpected feint, in his stories, is where I feel the wind move. Flannery O’Connor did that well (there’s a nice allusion to her in the closing line of one story); so did Kierkegaard, Walker Percy — other great writers to whom Russell is indebted and to whom he will be compared. He deserves the comparison.